The sequence and design of the lock houses built by the Lee Conservancy can be confusing. Perhaps this page will help you sort it out! 1878 Dobbs Weir Lock. Demolished February 1977. New house built by British Waterways in 1976. 1878 Hertford Lock. Extant. Now extended to rear. 1878 The three houses and two offices at Limehouse Lock. Extant. Interior much altered. 1878 Ponders End Lock. Demolished 1959 to make way for second lock chamber. Replaced by British Waterways house, now also demolished. 1878 Waltham Town Lock. Extant in original position of lock, south of Highbridge Street. 1881 Tottenham Lock. Demolished 1960 to make way for second lock chamber. Replaced by British Waterways house. 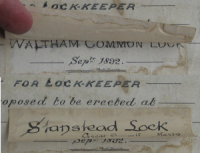 1893 Waltham Common Lock. Extant. 1895 Aqueduct Lock. Burnt down 1975. Not replaced. 1936 Carthagena Lock. Extant, much enlarged. 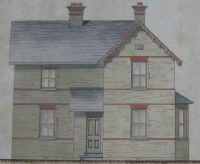 Although Hardmead Lock house, built in 1876, had the external appearance of the later 1878 design, the internal layout was different, with a central staircase rising from 3 feet inside the front door, effectively dividing the house in two. Rammey Marsh Lock house (1877) also had this central staircase. 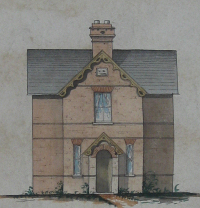 The most popular design (1878) was used at seven locks. The staircase in these houses climbed transversely up the back wall, some from the right hand side and some from the left. It seems to depend which side of the Navigation the house was built. Hertford and Feildes Weir (on the east bank) are both right handed whereas Dobbs Weir, Tottenham, Waltham Town were/are left handed. 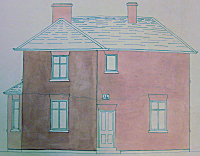 The long-gone houses at Picketts and Ponders End, also on the western side were almost certainly left handed as well. 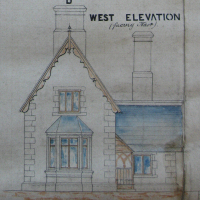 The Waltham Common house (1893) and that at Stanstead Lock (1899) used the same set of drawings with "Stanstead" pasted over "Waltham Common. 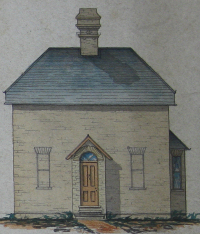 Whereas Carthagena lock house (1936) was, unsurprisingly, a new layout altogether.